(Nanowerk News) A substance used in nanotechnology contains unusual structures at its surface, a team of researchers led by Oleg Shpyrko, Distinguished Postdoctoral Fellow at the U.S. Department of Energy’s Argonne National Laboratory have learned. The research results, developed at the Center for Nanoscale Materials at Argonne, are published today [July 7, 2006] in the journal Science. The substance in question is a gold-silicon eutectic alloy, 82 percent gold and 18 percent silicon. The term eutectic means that the combination melts at a temperature lower than that of the melting temperature of either of its components. For most eutectic alloys, the difference between the melting point of the alloy and those of its pure components is about 100 degrees Centigrade; the gold-silicon eutectic alloy melts about 1,000°C lower than either of its components, at 360°C (680°F). 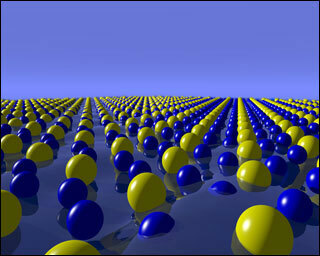 This image represents periodically ordered gold (yellow) and silicon (blue) atoms within the surface-frozen monolayer of liquid gold-silicon eutectic alloy. Research on this surface was conducted at both Brookhaven National Laboratory and Argonne National Laboratory. But that’s not the only unusual thing about the gold-silicon eutectic alloy. In a crystalline solid, atoms are arranged in an orderly, periodic fashion, and in a liquid, arrangements of atoms are disordered. It’s been known for about ten years that many metallic liquids show two or three distinct atomic layers near the surface, and usually there is no crystalline-like order within these layers. However, Shpyrko and his colleagues found that the gold-silicon eutectic alloy has seven or eight layers near its surface. In trying to understand this unexpected development, they found also that the top-most surface layer includes a crystal-like structure, similar to that normally found only in solid substances. Understanding characteristics of novel surface phases like this surface-frozen monolayer is important for the growing realm of nanotechnology, in which the basic unit of measurement is a billionth of a meter. Gold and silicon are especially important to understand because they are used in computer technology. Gold is an oxide-resistant “noble” metal that is easily shaped into tiny computer chip interconnects, and silicon is the principal component of most semiconductor devices. “If you think about it, you have gold and silicon in contact with each other in about every electronic device,” Shpyrko said. Shpyrko began the research as a doctoral student at Harvard University and finished it at Argonne. He used Argonne’s Advanced Photon Source, which provides the most brilliant x-ray beams available in the Western Hemisphere, to perform several tests on the material: x-ray specular reflectivity, which provides information about atomic structure normal to the surface; x-ray grazing incidence diffraction, which provides information about in-plane structure; x-ray diffuse scattering, which provides information about waves and other dynamics at the surface; and x-ray crystal truncation rod, which measures thickness and structure of the crystalline surface layer. Co-authors on the Science article were Reinhard Streitel, Venkatachalapathy S.K. Balagurusamy, Alexei Y. Grigoriev and Prof. Peter S. Pershan of Harvard University; Prof. Moshe Deutsch of Bar-Ilan University in Israel; Benjamin M. Ocko of Brookhaven National Laboratory; and Mati Meron and Binhua Lin of the University of Chicago. This work was supported by the Department of Energy, through the Office of Science Office of Basic Energy Sciences, and by the U.S.-Israel Binational Science Foundation, Jerusalem. Measurements at Brookhaven were also supported by the Office of Basic Energy Sciences. The nation’s first national laboratory, Argonne National Laboratory conducts basic and applied scientific research across a wide spectrum of disciplines, ranging from high-energy physics to climatology and biotechnology. Since 1990, Argonne has worked with more than 600 companies and numerous federal agencies and other organizations to help advance America’s scientific leadership and prepare the nation for the future. Argonne is managed by the University of Chicago for the U.S. Department of Energy’s Office of Science.